A day after Moscow warned the US over truce violations in Syria, the United Nations has called on all parties to the conflict in Syria to work together to support the ceasefire, UN spokesman Farhan Haq said. “So we want to encourage everyone to work together, whether they are the parties on the ground, the guarantors or anyone else, to make sure that the cessation of the hostilities will continue and will last as long as we could possibly keep it going,” Haq said. The UN spokesperson’s remarks came after Russian Lieutenant General Sergei Rudskoy accused Washington of showing “no readiness” to agree how to enforce the truce. He warned Russia would resort to force against armed groups systematically violating the ceasefire if necessary. “The delay in the entry into force of the rules agreed upon for responding to violations of the ceasefire in Syria is unacceptable,” Rudskoy said in a statement on Monday. He said that Russia had sent the corresponding proposals on February 25. The Russian-US consultations on March 18 in Jordan’s capital Amman showed that Washington was not prepared to discuss in detail Moscow’s proposals, he said. Moscow would only use force “after receiving credible evidence of armed groups’ systematic violations” of the truce, Rudskoy added. The US Department of State said that the statements of the Russian side contradict the agreements on ceasefire in Syria reached by Russia and the US in February. Spokesman John Kirby refused to speak about the proposals of the US side. Russia had supported the partial ceasefire brought in last month by announcing last week it would withdraw most of its troops from Syria. The ceasefire does not include the Islamic State and the AL-Nusra front. Russian airstrikes and Syrian government offensive continues against the Islamic State group (IS) and Al-Qaeda linked Al-Nusra Front in the war-torn country. The main opposition, the Syrian rebel group, along with the United States and other Western nations, has long insisted any peace deal must include Syrian President Bashar al-Assad’s departure from power, while the Syrian government and Russia have said there is no such clause in the international agreements that underwrite the peace process. Russia, along with its BRICS partners, are opposed to the ouster of Assad. 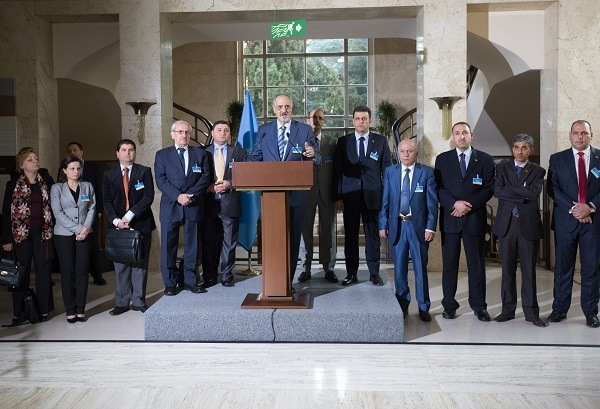 Head of the Syrian government delegation Bashar Jaafari told the press in Geneva on Monday that the fate of Assad is not an issue which should be brought up at talks aiming to broker a political end to the five-year conflict.